OCCJ’s Inclusive Leadership Collective (ILC) develops leaders who are informed and respectfully face challenges of diversity, instead of recoiling, to create equitable workplaces in our state. ILC seeks to create a place to live that attracts and retains top talent where hospitality and justice are the new normal. •	Promote OCCJ’s mission of achieving respect and understanding for all people through education, advocacy and dialogue. •	Develop Oklahoma’s next generation of inclusive leaders. •	Build a network of inclusive leaders who are a resource for companies and organizations. OCCJ’s ILC consists of a leadership team of professionals working to bring dynamic diversity, inclusion, and equity programming to the community. 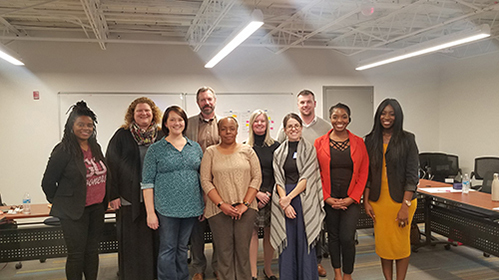 The leadership team plans four quarterly events open to all members of ILC as well as a flagship program called the Inclusive Leadership Institute. At the institute, Oklahoma professionals have the opportunity to develop the necessary skills and tools to become more inclusive leaders. OCCJ’s Inclusive Leadership Collective presents the Inclusive Leadership Institute, a flagship leadership development institute focused on diversity and inclusion. This leadership institute aims to develop Oklahoma professionals into leaders skilled with the knowledge and tools necessary to create inclusive workplaces and communities. This institute seeks applicants who are interested in making a difference in the community and at work. The institute comprises of four half-day workshops and is presented with the support of skilled facilitators. The application period for the fall session of the Inclusive Leadership Insitute has closed. For more information contact our office at info@occjok.org or (918) 583-1361. Invest in ILC and OCCJ today!